Rebuilding Skin…Rebuilding Lives… DMK believes that the origin of most skin conditions is a result of disharmony within the skin. Using the principles of biochemistry, DMK has formulated a range of treatments and products designed to educate skin to perform like youthful healthy skin. By matching formulations with the body’s chemistry, the skin is encouraged to respond in a positive manner. DMK’s revolutionary concept of: Remove – Rebuild – Protect – Maintain aims to match an individual’s biochemistry with the appropriate skin therapy. Botanical-based paramedical products make up the DMK skin care program. Maintain beautiful skin with Home Prescriptives which work to prolong the results achieved by DMK Professional Treatments. A real eye opener. Whether you suffer from wrinkles, fine lines, puffiness, and dark circles or simply dull lifeless skin around the eyes, the DMK Eye Fusion treatment will revitalise your appearance. Where some cosmetic facial treatments may only act on the surface of the skin, DMK Enzyme Treatments works with the skin. The enzymes strengthen the structural integrity of the skin to create a healthy environment for cells to live and thrive in. An excellent resurfacing treatment for skin that exhibits a heavy build up of dead material or deeply congested or acne skin. Hydradermaze addresses the causal factors involved in the pathophysiology of acne. Hydradermaze is recommended as a course of treatments to achieve an advanced skin revision. This is a more progressive way to resurface and revise the skin if you do not want to peel like with our RP or Pro Alpha 6 Layer Peel. Combines the forces of Pro Alpha, Prozyme and Enzyme Therapy for various skin conditions. AlphaZyme benefits dehydrated, mature skin with loss of elasticity and volume. It is also suitable for pigmentation, sun-damage or someone requiring a refreshed replenished skin plumping treatment. Is an advanced skin revision program which suits anyone who are looking for an alternative more progressive approach to the traditional peel. Pro Peel is perfect for anyone who does not like a full on peeling effect or skin that needs strengthening as well as resurfacing. firms the skin; it can also help to restore optimal skin function which is the key to youthful, healthy, firmer skin. Fight against the decline that causes ageing. An instant pick me up for the skin. Firm, brighten and tighten your skin instantly with DMK special occasion treatment. The perfect accessory for a wedding or party. DMK’s Lunchtime Peel is the best-kept age management secret. Formulated for clients who are office bound and time poor where skin is impacted by air-conditioning and lifestyle choices (all of which exacerbate the general ageing process) – this peel is perfect! The Lunchtime Peel performs a controlled micro-removal of the epidermis, leaving the skin looking instantly radiant and luminous. It is also a great option to minimise fine-lines and wrinkles, minimise open pores and brighten the skin. This process also encourages new cells to grow stronger and healthier. But the best part is that this peel addresses the symptom of the condition without any visible downtime or post treatment irritations. A non-invasive treatment of wrinkles or fragile skin. Liquid laser is a light, non-invasive Revitosin-based treatment that focuses on strengthening, firming and rebuilding the skin. Great for fine lines, superficial wrinkles, fragile, weak or dehydrated skin. Consultation Required and Must be on DMK Home Prescriptive. RP is a system based on DMK’s Remove, Rebuild, Protect and Maintain philosophy. It revises the architecture of the skin, addressing the underlying conditions, with an aim to return these areas to a strong, healthy and youthful condition. RP treatments look at the causative factors contributing to sun damage, pigmentation, and premature aging. RP is based on the preservation of healthy and attractive skin on the body and face. Consultation Required and Must be on DMK Home Prescriptive. Pro Alpha Six Layer Peel is an integrative aesthetic approach to skin restoration. Not everyone wants to commit to cosmetic surgery when signs of aging become apparent. Many people prefer to start with a less invasive procedure such as the Pro Alpha Six Layer Peel. This professionally applied treatment revises the old damaged skin and works to re-establish structural integrity. Pro Alpha Six Layer Peel is like a skin renovation. The Pro Alpha Six Layer Peel is an exclusive blend of AHA’s and BHA’s applied systematically in layers. the strength of the formulation is tailored by your therapist to suit your skin colour, texture, sensitivity and conditions. The procedure takes 14 days. Combing DMK Quick Peel will help to pump fresh oxygenated blood through the capillaries while the IPL will assist in cauterization of the capillaries and aid in the reduction of redness. Using the DMK melanoplex system in conjunction with IPL will help the skin to respond positively to the treatment of pigmentation and assist in achieving maximum results. 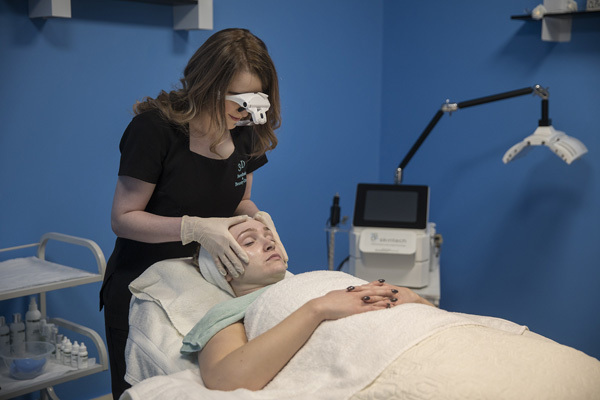 A consultation is required prior to all skin treatments for first time clients.